One autumn a curious set of leaves appeared from the shaggy neck of a very large bulb in my newly acquired garden. The leaves multiplied and extended flat, outward. My guess was a Nerine or Amaryllis belladonna, or perhaps even a cold-hardy Hippeastrum. I was made to wait for flowers; when the full ‘star-burst’ flower head finally unfurled I was stunned. I was finally able to identify at least the genus when I saw a piece on TV – it may have been an episode of David Attenborough’s wonderful series The Private Life of Plants. The documentary showed a swathe of large, spherical seed heads being uprooted by the wind and tumbled along the semi-arid South African desert floor. As they rolled they released seeds into the then-moist soil. The commentator identified them as a species of Brunsvigia. 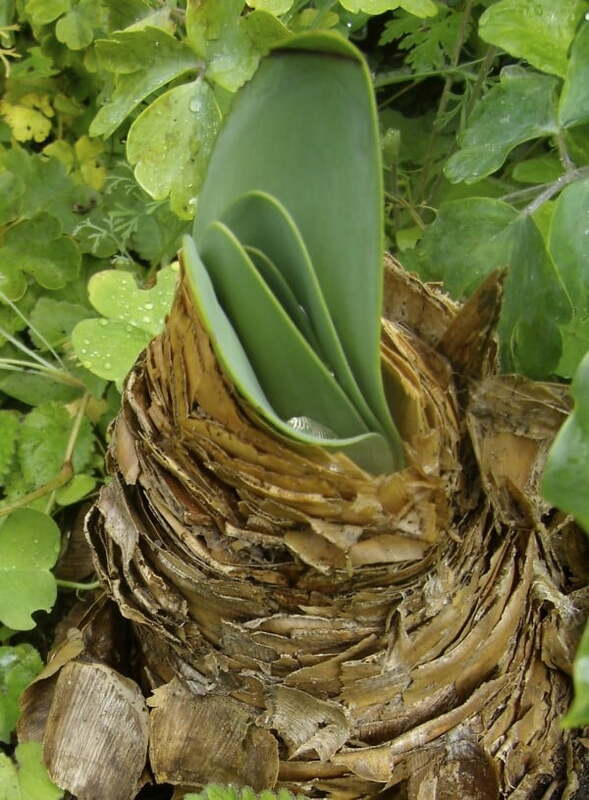 Further research showed my bulb was a mature Brunsvigia josephinae, and this was confirmed by the flower colour, the semi-submersion of the bulb, the brown and papery bulb ‘tunic’ and the plant’s deciduous habit. Lorenz Heisters, a botanist and professor of medicine at the University of Helmstädt first published the name Brunsvigia in 1755. It was named for Karl Wilhelm Ferdinand (Duke of Brunswick-Wolfenbüttel) whom it is believed promoted the study of plants, including several Brunsvigia species. 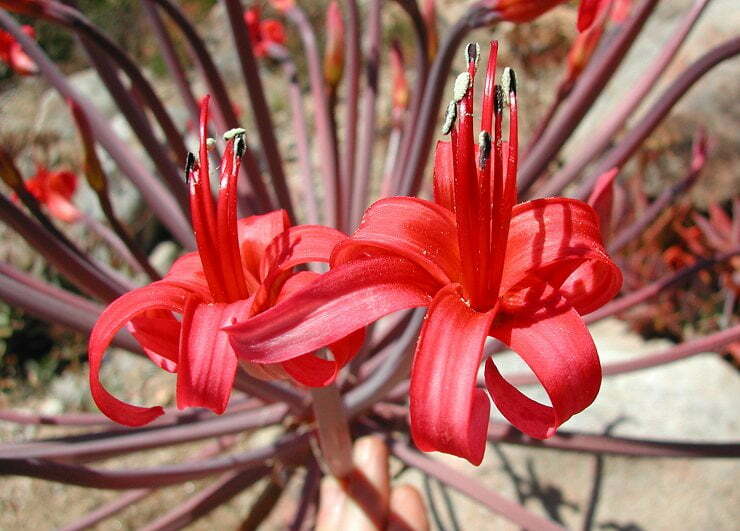 The genus, a deciduous, temperate member of the family of Amaryllidaceae, has about 20 species in total and is widespread in southern Africa, mostly in semi-arid areas. Brunsvigia josephinae (syn. 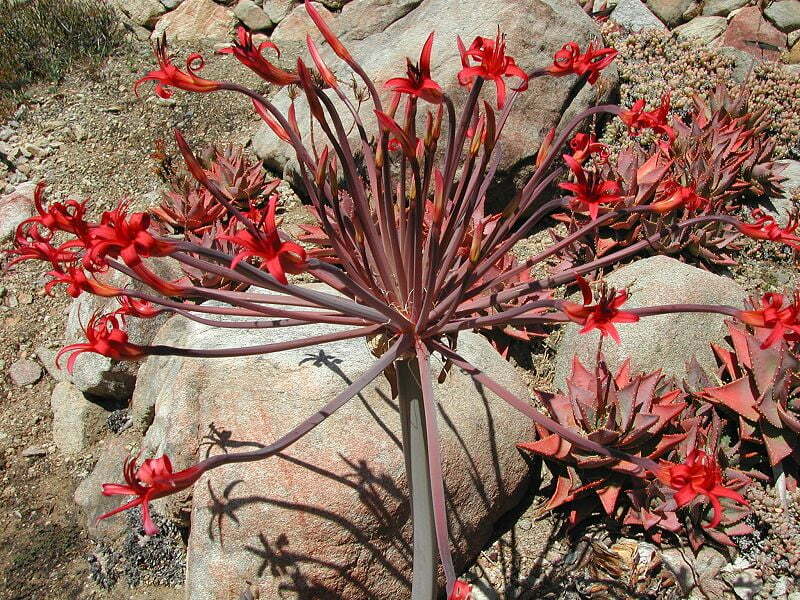 Brunsvigia gydobergensis), commonly called Josephine’s Lily or Candelabra Lily, is named for Joséphine de Beauharnais, Napoleon’s first wife and the first Empress of France. Joséphine’s garden at her primary estate, the Château de Malmaison, was deemed ‘the most beautiful and curious garden in Europe, a model of good cultivation’. Her connection with South Africa is due to her competitive and compulsive desire to gather plant specimens for Malmaison. Botanists accompanied Napoleon on his various campaigns and other voyagers were engaged to bring back the rare, beautiful and exotic. These included Nicolas Baudin (the Pacific and Australia), Alexander von Humboldt and Aimé Bonpland (South America) and prominent English nurserymen Lee and Kennedy whom Joséphine even co-funded (and later ran up debts to), particularly for some of the South African collecting trips of the young plant hunter James Niven. At Malmaison she established a huge orangerie, built a greenhouse heated by a dozen coal-burning stoves and erected a large nursery from which she distributed plants to other French garden connoisseurs. From 1803 until her death in 1814, Joséphine cultivated nearly 200 new plants in France for the first time. Brunsvigia josephinae is a tall variety, at about a metre in height when fully in flower. The blueish-grey leaves (up to as many as 20), which develop in winter, often lie mostly flat on the ground. Its bulbs are some 200 mm in diameter, with the neck and tunic partially exposed. 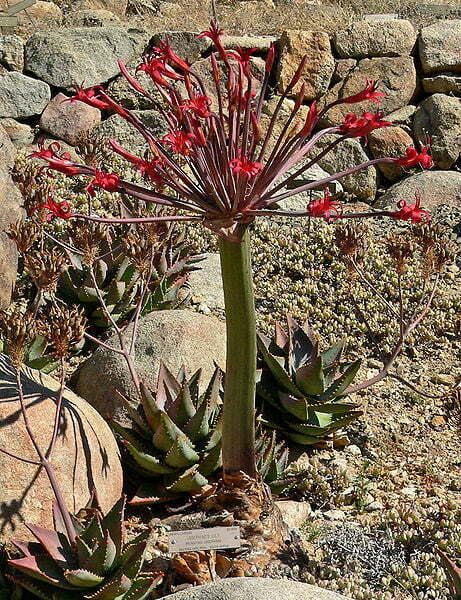 Brunsvigia josephinae is also distinguished by a single, long, initially flattened, dark pink to red flower bud which shoots from each bulb in autumn. Dark red, tubular 15mm long flowers appear atop stalks, with 30 – 40 flowers per stalk. Bulbs can take 12 -14 years to settle (from seed) before they flower, and bulb growers online note they flower annually once established. I have found mine to flower only every second year in the six or so years I have been at this site. From the seed I have been able to collect, I have not had any success with germination. I suspect I am being too generous with soil quality and water, given the tough conditions shown in the documentary. I also seem to recall the commentator noting there was a very brief window of time for seed to germinate in the freshly rain-moistened South African desert sand and clearly I have not been able to emulate these specific conditions. Nor have any seedlings grown in the vicinity of the one parent plant and the neck shows no signs of new bulbs or bulbils. Wind assisted dispersal is not the only method the species employs to ensure future plants. In their endemic environment, sunbirds, which feed on the nectar in the long red and curved flowers, are known pollinators. Culturally, the dry bulb tunics are used as a wound dressing and it has been stated young Xhosa men use the tunics as plasters after circumcision. Otherwise infusions of the bulbs are used for medicinal purposes or to enhance divination; however, as with all members of the Amaryllis family, Brunsvigia leaves, stems and bulbs contain phenanthridine alkaloids, which can cause vomiting, hypotension and respiratory depression in humans, cats and dogs. Excess salivation and abdominal discomfort is caused by the raphides (needle-shaped crystals) of calcium oxalate, which are most concentrated in the bulbs. I am in the throes of transplanting as much of this garden as I can manage (while still leaving a flourishing legacy for the new gardeners). I will lift my large, magnificent Brunsvigia bulb when it is dormant and carefully convey it to its new home – a sandy, Mediterranean-climate garden. These may be exactly the conditions that will foster germination of the next round of viable seeds. I commented to a friend recently on the abundance of Brunsvigia plants in the small settlement to which I have moved. I had it explained to me that when a particular house was for sale over a decade ago, many local gardeners, in the fear this house’s large and splendid clump of very mature Brunsvigia bulbs would be uprooted and destroyed, raised and replanted bulbs around town overnight. These dispersed bulbs are all thriving, an indication mine too will be happy in its new coastal home. Dr. Catriona McLeod is a writer, environmental & cultural consultant, horticulturalist and designer based in Tasmania. Catriona worked as a horticulturalist in plant nurseries, while studying architecture and landscape architecture in Brisbane. After travelling, and working as a designer and horticultural consultant, she completed a PhD in green design. Until 2012 she taught design principles, landscape architecture, ecology, design theory, horticulture and sustainable practices at the University of Tasmania. She is a passionate advocate of wild places and the preservation of threatened environments and species and is, of course, an avid and always-learning gardener. Paid $25 for a bulb the size of the tip of your pinky. I’ve stuck it in a huge pot (with a regrettable stack of broken crock in the bottom) and was told to wait 15 years to see it flowering. I shall wait. Thank you for your comment. I too initially baulked at the cost of these bulbs, but given their slow growth rate and exquisite flowers I think they are worth it. I think you may see flowers before 15 years. Be patient and don’t overwater your bulb!! I bought an established one from a nursery last year, it’s leaves are just dying off now (start of spring) and I can’t wait to see if it flowers. It did flower last year, and I sewed the seeds fresh in seed raising mix and misted daily. I got success from the fleshier seeds, there are two very thin cotyledons about 3cm high and that’s it. These cotyledons are starting to die off but I’m pretty sure that’s normal as the parent plant is doing the same in preparation for the flowering. Of course, I don’t expect the seedling to flower for around 20 years. Watch this space, haha. That’s great you got some seeds to germinate. I wait in hope! Good to know your tip about the fleshier seeds germinating. I suspect your plants may flower earlier than 20 years. Fingers crossed! I have a Brunsvigia Josephenae which has been in our family for many years, approx 1950’s or 1960’s, so long ago when I was young. It has been divided and shared around. I have several divisions, 2 of which are flowering now, The bulbs are huge, and because of moving house are now in pots and have not flowered every year as when in the ground. Flowering 4 yearly seems to be a pattern. ones growing against their mother who is as big as a football. Hi Max, I have two very large ones that have flowered last year – each in small plastic pots – they have started again – should I be feeding them ? (I’m in Tasmania too ). Hello Max. I too am in Tasmania [Hobart] and bought a 40 year old bulb 25 years ago. It has developed to the size of a basket ball and sits almost fully out of the bare ground without any competition from nearby plants and is baked by the sun which reproduces their natural growing conditions from South Africa as much as is possible in Hobart. It has produced 8 “pups” in a crowded bunch, the first “born” of which is the size of a football after 10 plus years and is now also flowering each year. I pollinate between them and nerines/amarallis with a soft paint brush and they set lots of fertile seed that I plant then in sandy seed raising mix as soon as the paper covering starts to split and before the swollen seed can drop. I have planted out about 50 seedling bulblets but the oldest is about 5 years old and I have yet to see any of them flower to find out if there are new hybrids, all rather hit and miss. How does my experience compare? We are also in Tas and acquired our main candelabra bulb in 2000 from a long held family farm. We kept it in a big pot and it first flowered in 2003 even though my mum said it wouldn’t flower in a pot. (Sorry Mum.) Since moving and having a large new garden the bulb was planted out in 2008 and the first flower in the garden was in 2010. When the flower stalk dried and broke away I found the seeds and out of pure curiosity I harvested them. Because I knew nothing about growing the seeds I left them on the kitchen souh eastern facing window sill intending to look into it. Some days later I noticed white curly growth from the pointy end. This later turned out to be roots which turned downwards on the soil in a pot. From there after planting, a green shoot emerged from the same pointy end which was the first leaf. I have become obsessed and each year harvest the seeds and now have 44 seedlings since 2011 until 2016 which I have just planted into their own pots but keep the younger ones behind glass. 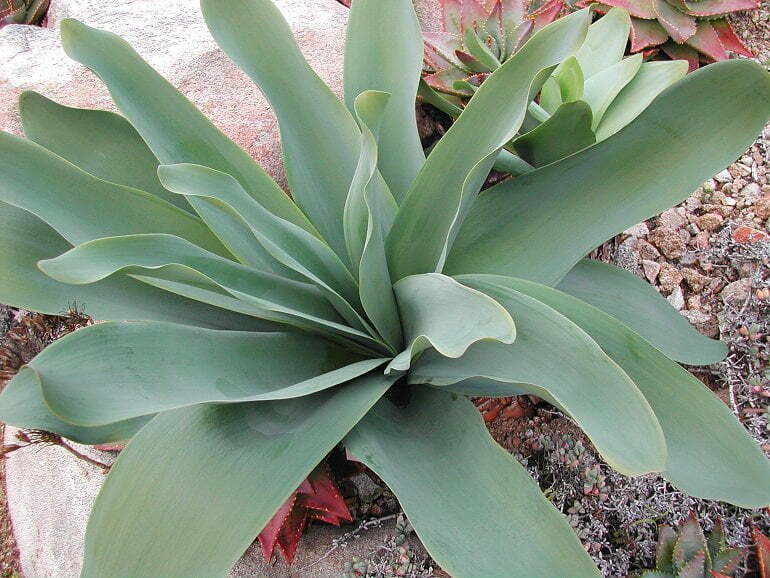 The oldest plants are the size of a daffodil bulb with huge roots. I probably won’t be around long enough to see them all flower so I am trying to convince myself not to keep any from this years flowers. Kerry ulv tas I have 5 brunsvigia which flower every year I have them in the ground they do very well , my question is I hav some bulbits that are growing on the main plant ,can I remove them now to replant . I have a large b’vigia which flowers every year. it’s the size of a lge cricket ball.It’s in a large pot with it’s neck well out. I don’t feed it. This year there are small white marks on the leaf – a bit like tiny raindrops and some of the leaves are turning yellowy brown. if anyone in Tasmania knows what disease my plant has and a treatment I’d appreciate some info. I have many bulblets in pots – they thrive on neglect. Hi I have approx, 50 bulbs in pots ,a few flower every year, I`ve never had the disease you said,my address is Ulverstone Tasmania . I would welcome a visit. I had an interesting thing occur recently in my Tasmanian garden – a hailstorm deposited a thick layer of very small ice crystals on my plants overnight. Unlike frost, which disappears fairly quickly, the mushy hail sat on the leaves for a few hours after sun-up. After it had melted, the leaves of many of my fleshy-leaved plants – such as bulbs and succulents – had tiny white pits all over them. I think this might be like ice-burn. I’m wondering if a similar thing could have happened to your plants. As for the yellowing leaves, this could be normal attrition, but could also indicate an imbalance in pH or trace elements. I have at least 30 of these bulbs which flower each year. However I’ve only recently identified them as the Candelabra Lily. They were originally in the garden of a house my parents bought here in Adelaide (Sth Australia) but they never flowered probably due to my mother watering them in Summer (too much love). When my parents moved I took 2 bulbs for our garden and after several years they flowered. Then we moved house 13yrs ago so the bulbs came with us as they were something special (never seen them elsewhere). I dumped them behind my garage in dirt till I could decide where to put them and they have multiplied to the 30 bulbs I have today and have been flowering for several years in that spot. I recently decided to move them (what a hard job to dig them up) and decided to identify them. They probably won’t flower for years now as I’ve disturbed them again. The pink flowers stand about 4ft (1.5m) high. Hi, I live near Ulverstone, Tasmania, and inherited 2 Brunsvigia Js when I bought the house. They both flower, both have large bulbs and both have leaves coming off the base at soil level. When and how do I divide them off OR should I just let them do their own thing for a while? Appreciate the comments so far in the site. Thank you.